Hier die Geschichte, alles ist wahr, Ehrenwort! Mit meinem besten Freund Lutwin Hieronymi habe ich im Sommer zwei Wochen in London verbracht. Wir hatten im Melody Maker gelesen, dass die Beatles eine Art Büro mit dem Namen APPLE besaßen. Wir sind - der 5. 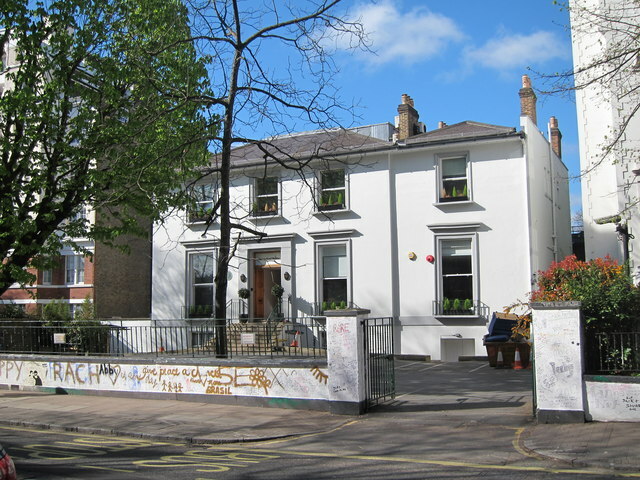 August 1969 war's  morgens gleich hin, man sagte uns aber, die Beatles würden heute im EMI-Studio in der Abbey Road aufnehmen. Dort haben wir eine gute Stunde mit ca. zehn weiteren Fans gewartet. Dann kam Paul McCartney im Mini-Cooper auf den Hof gefahren. Alle sind hin, um sich ein Autogramm geben zu lassen. Wir waren natürlich viel zu stolz (Fankram). Paul begrüßte seine Fans ganz herzlich und gab ohne Stress und Hektik Autogramme. Eine Stunde später ging’s dann richtig los: Erst kam George Harrison und dann Ringo (total feist beide Arme ausgestreckt auf dem Rücksitz). Beide im Rolls Royce. Das fanden wir ziemlich unangenehm. Dann kamen John Lennon und Yoko Ono, beide in den weißen wehenden Klamotten. Wir standen an dem berühmten Aufgang zur Eingangstür der Studios, und John eilte mit Yoko im Laufschritt direkt an mir vorbei. Ich konnte nicht anders, ich habe spontan ganz laut „RINGO“ gekreischt. John Lennon hat unheimlich blöd geguckt. Danach kam George Martin, ich glaube in einem offenen englischen Sportwagen. Den Beatles Produzenten George Martin hatte ich schon immer irgendwie bewundert. Ich bin hin und habe mir dann doch ein Autogramm auf die Rückseite des Mitgliedausweises vom Marquee Club geben lassen. It seems somehow apt that the Beatles should have been among the first to make use of a new musical instrument which, after their demise, would shape the future of rock music almost as profoundly as they had done: the synthesizer, as invented by one Dr Robert Moog. Compared to today's microchip microeverything, the early "Moog's" were veritable monstrosities, with a huge bank of wires and a large two-tiered keyboard. George Harrison, in particular , expressed great interest in the invention and bought one early in 1969, recording an album at his home, Electronic Sounds, full of its strange noises, which was released in May by Apple's short-lived "experimental" offshoot, Zapple. 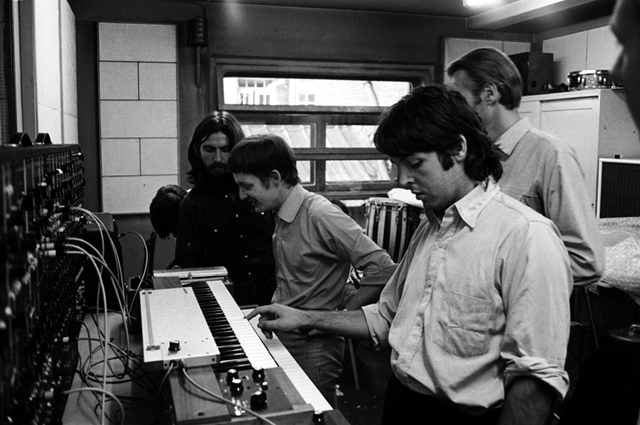 Now, in early August, George had his Moog transported into EMI for the Abbey Road sessions, and with Mike Vickers the Manfred Mann instrumentalist who also conducted the 'All You Need Is Love' orchestra recruited as expert consultant / programmer, the Beatles began to make constructive use of the instrument in the closing weeks of the Abbey Road sessions. "The Moog was set up in Room 43," recalls John Kurlander, "and the sound was fed from there by a -mono cable to whichever control room we were in. All four Beatles - but particulary George - expressed great interest in it, trying out different things." "Everybody was fascinated by it," says Alan Parsons. "We were all crowding around to have a look. 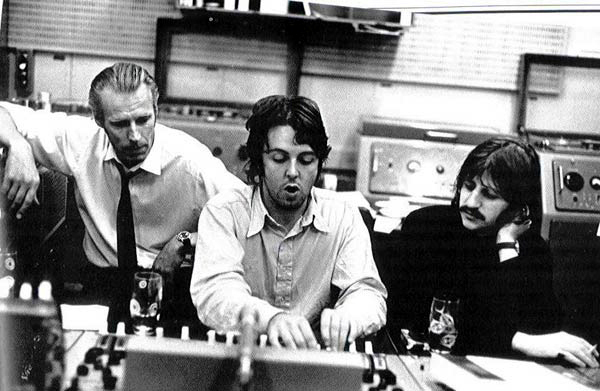 Paul used the Moog for the solo in' Maxwell's Silver Hammer' but the notes were not from the keyboard. He did that with a continuous ribbon-slide thing, just moving his finger up and down on an endless ribbon. It's very difficult to find the right notes, rather like a violin, but Paul picked it up straight away. He can pick up anything musical in a couple of days. " "I think the Beatles used the Moog with great subtlety." says Nick Webb. "Others in a similar situation would probably have gone completely over the top with it. It's there, on the record, but not obtrusively. Perhaps they weren 't sure it was going to catch on!" 'Because' was the recipient of the first Moog overdubs, played by George and recorded twice, for the last two available tape tracks, in a studio two session commencing at 6.30pm. With this, the song was complete. The final overdub on this day was of voca1s for 'The End', the song's first.